A controversial plan to replace Kilsyth’s fire engine with a smaller rapid response unit has been reversed. The appliance at Kilsyth Fire Station, which is crewed on a retained basis, was ear-marked for replacement by the smaller unit, but this provoked outcry from local councillors and residents, who feared it was ill-suited to the needs of the town. At the most recent full meeting of North Lanarkshire Council, Kilsyth councillor Heather McVey described the new units as “vastly inferior”, citing issues such as shorter ladders and weaker water pumping systems. The town’s three councillors, Heather McVey, Mark Kerr and Jean Jones, recently met with fire service officials to confirm this plan had now been withdrawn. Speaking after the meeting, Councillor Kerr said: “I’m happy to advise that Fire Scotland has confirmed that Kilsyth will not get the new Rapid Response Unit (RRU) at a meeting with the local councillors today. They say it is needed elsewhere but did use the words ‘at present’. “All three councillors have agreed that we may have won the battle but not the war. 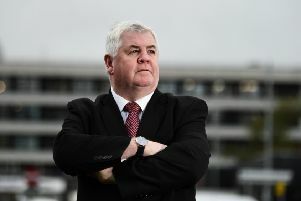 “The roll out will continue elsewhere, when this happens we can see the positive aspects and demand that any shortcomings be rectified before its put back on the table for Kilsyth. Garry Mackay is the Scottish Fire and Rescue Service’s Local Senior Officer for North Lanarkshire. He said: “After a considered period of consultation, there are presently no plans to replace existing vehicles with one of our new state-of-the-art fire appliances at Kilsyth Community Fire Station. “But let me be clear, these bespoke and agile vehicles carry the latest proven technology designed to not only enhance the protection of our communities – but the safety of our firefighters. “They include Ultra High Pressure Lances, which enable our crews to tackle fire quickly and more safely from the outside of a building, around ten times faster than traditional firefighting methods. “It was recently unveiled at our National Training Centre where it was welcomed by our Community Safety Minister and retained firefighters from across the country who are truly committed to the safety of their communities. “We are an organisation that prides itself on working with our partners, pulling together to do the only thing that really matters – save lives and protect our communities. The fire engine replacement programme was announced after it emerged that SFRS is facing a £400m reduction in its budget.